Manolo Luis Sánchez is the main protagonist of The Book of Life. Manolo wears a black Traje de luces decorated with hearts in various places, winged hearts and corazón del santos, skulls with crossbones, and gold chaquetilla with a pink corbatin and taleguilla. Manolo wears black shoes. He also appears to have pink/red espadas. The sleeves of his chaquetilla have curls protruding from the elbows. Manolo has dark brown and black hair tied back into a ponytail which curls at the end. His bangs and hair curl upwards into a curly swirl. Manolo is a kind, sensitive & brave young man. He has a passion for music, and a love for playing music with his guitar; Manolo dreams of being a guitarrista and a musician rather then be a bullfighter like almost all of Sanchez family bullfighter but he does have the gift and talent for bullfighting. Manolo truly thinks and believes killing the bull in bullfighting is wrong. He is a sweet, compassionate young man who truly loves and cares for his family, his best friends and the town of San Angel very dearly. Of course, he also has his moments of insecurity, like when he doubting that he could be able to win Maria's love. And although he is not in agreement with the tradition of his family, he feels that he can not rebel because he fears disappointing his father. Manolo is first shown, in the film as a child with his best friends, Maria Posada and Joaquin Mondragon. Both Joaquin are trying to impress Maria to win her love and affection. Manolo plays his guitar while Joaquin pretends to fight Manolo with his sword. When Manolo and Maria are called by their fathers, they leave Joaquin alone. Manolo meets up with his father, Carlos, and Grandmother Sanchez, to show respect to his mother Carmen. It is the Day Of The Dead, and Carlos tells his son that if he remembers their ancestors, he can feel their presence, but if they are forgotten, they are gone forever. Manolo starts to think about his family. The whole Sanchez family appears in a ghost form, and Manolo says he can feel their presence. La Muerte, disguised as a human female, walks up to the group, and asks if she can have some bread. Manolo states that his mother would be quite happy to give some bread, with Carlos agreeing. In reward, Manolo is blessed by La Muerte, being given the blessing "May your heart always be pure and courageous" The day after that, Manolo risks his life trying to save the town from a giant boar. During the montage, Manolo and Joaquin grow up. Joaquin gets more selfish, as Manolo gets more in to bullfighting. Maria and Manolo have always been best friends since they were children. Manolo has always been in love with Maria. He vowed to always play from the heart due to what she engraved on his guitar. He loved her so much that he was willing to die to meet her in the Land of the Remembered. Ten years later Maria and Manolo end up marrying each other in the near the end of the film. Joaquin is Manolo's other best friend since they were children. Their relationship dwindled somewhat due to being pulled in different directions by General Posada and Carlos Sanchez expectations for the boys. Not much is shown of their relationship, but it is certainly a strong friendship, as 10 years of rivalry for Maria's love hasn't set them apart. Manolo was willing to sacrifice himself during the battle against Chakal, showing how much he values his friend Joaquín; coming to consider him as a brother. And in fact, Manolo accepted that Joaquín was his wedding godfather. Carlos is Manolo's father. Carlos wanted his first born and only son Manolo to follow and continue the Sanchez family tradition of being a bullfighter, but Manolo instead wants to become musician than become a Sanchez bullfighter like almost all Sanchez family bullfighters before him. Carlos truly thinks and believes that a bullfighter must always kill the bull in bullfighting, which causes an even greater rift between father and son. Although he may not agree with him, Manolo loves his father and wants to make him proud. Why he even cried at Manolo's wedding! Carmen is the deceased mother of Manolo. She never wanted Manolo to take on the family role as a bullfighter; but as Carlos had said the opposite to Manolo, her son became a bullfighter to honor "the wishes of his mother." Manolo always remembered her with a lot of affection, and when he reunited with her in the Land of the Remembered, he was more than excited to stay there with her and the rest of the Sanchez Family. Although Manolo was willing to recover his life after discovering that Maria was still alive, it was clear that a part of him wanted to remain with his mother. 3 years after Manolo and María got married, they had twin girls and later a boy. Manolo and Maria wrote to each other during the time she was in Spain. Manolo gives stuff away to the kids at the orphanage. In the book of life art book for the movie, Manolo's first guitar that is broken was red because it is María's favorite color. When Manolo is judged by the Guardian, he mentions that Manolo's heart is 'pure and courageous'. This is the blessing that Manolo received from La Muerte when he was a child on the Day of the Dead. After the movie Manolo and Maria moved in with her father, though it didn't last for long. 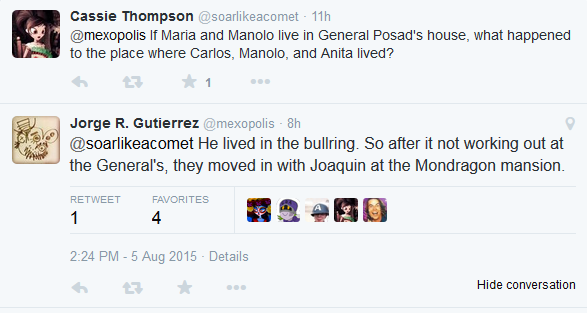 They then move into Joaquin's mansion . There was an alternate scene of which Manolo meets his ancestors and his mother according to the artbook of the movie, in which he arrives at his family ancestors' home in The Land of the Remembered, and they all in a the middle of a meal when they saw Manolo walk through the front door, and all the family members having shocked looks on their faces. Manolo and Joaquin fighting as kids. Maria pushes both of them.